One of the loudest stadiums throughout American football, perhaps even place of birth of the 'Mexican wave'. 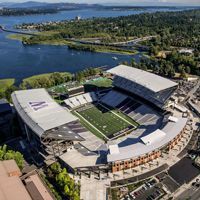 Please welcome Husky Stadium at StadiumDB.com before you can vote for in the Stadium of the Year competition! Opened in 1920, this football-athletic stadium at the south-eastern edge of University of Washington campus has always had a unique layout. Horseshoe shaped stands are opened towards the waters of Lake Washington to the east. The first sections, mostly raised on landfill, could accommodate 30,000 people. First upgrade came in 1936, when the horseshoe received additional rows, growing by 10,000. Then in 1950 a new upper deck came in the south, first part ever to get a cantilever roof. Similar structure was added in the north, forming the stadium's layout that we know today. The characteristics of the stadium remain to date despite its largest redevelopment, carried out in 2011-2013. What was also the university's largest financial challenge (with $261 million budget), almost all of the stadium was demolished. Only the northern upper deck was retained. When rebuilt, the stadium lost its athletic track and gained a minor stand in the east, but still with a great view of Lake Washington for most spectators. New infrastructure and corporate facilities were created, making the stadium university's largest source of income. The idea of retaining its historical shape was highly justified as the stadium became almost legendary for its atmosphere on matchdays. ESPN even measured noise level peak at 133 decibels, making it one of the world's loudest stadiums. Also, local claims suggest this is where the 'Mexican wave' was first done. Used on day-to-day basis by academic American football team Huskies, the stadium was also temporarily home to NFL team Seahawks. Husky Stadium also saw great political speeches, like those of presidents Harding and Reagan, as well as other important events like concerts.